Freshman Joel Farabee, sophomore Logan Cockerill and Team USA have advanced to the semifinals of the 2019 IIHF World Junior Championships in Vancouver. They’ll face Russia Friday in a 4 p.m. ET start with NHL Network and TSN broadcasting the game. Farabee, who had a natural hat trick in Team USA’s 8-2 win over Kazakhstan (recap & highlights), has five points in the tournament, while Cockerill is scoreless. Sophomore Shane Bowers had two assists in five games for Team Canada, which lost to Finland in the quarterfinals. Freshman Dominic Vidoli has left the team and joined USHL Sioux City. The defenseman from Culver Military Academy had made six starts for the Terriers. 2019 recruit Ethan Phillips had his first multiple goal game in the USHL, scoring twice in less than two minutes—including the game-winner—in Sioux Falls’ 4-2 win over Waterloo. With 20 points in 15 games, the right wing who joined the Stampede after starting the season with Selects Academy, is 10th in the USHL in points per game with 1.33. He’s been on the scoresheet in 14 of 15 games. 2019 recruit Liam Gorman and 2020 recruit Liam Connors each scored a goal in St. Sebastian’s 3-2 win against Nobles. Connors’ tally in the third was the eventual game-winner. 2020 recruit Luke Tuch scored his eighth goal in the NTDP U17s’ 5-4 shootout win against Tri-City Storm. Fellow recruit Drew Commesso stopped 29 shots to gain the win. Jack Eichel and Clayton Keller have been named to the 2019 NHL All-Star game in San Jose on January 26. For Eichel, who leads the Sabres in scoring with 49 points in 40 games, it’s his second all-star selection. Keller, making his first all-star appearance, tops Arizona in scoring with 29 points. Charlie Coyle scored his seventh goal in Minnesota’s 4-3 win against Toronto. Jordan Greenway picked up an assist for the Wild. New Jersey head coach John Hynes has been signed to a multi-year contract extension. The former BU forward and member of BU’s 1995 national championship team, is in his third season behind the Devils' bench. In the first meeting of former Terrier teammates and current NHL head coaches Mike Sullivan and David Quinn, the victory went to Sullivan’s Penguins who pasted the Rangers, 7-2. Goals were hard to come by in BU's two-game series against Penn State at Walter Brown Arena last weekend. The teams played a 1-1 tie in the first game with junior Sammy Davis scoring the only goal for BU. The Nittany Lions won the second game, 1-0, despite 33 saves by freshman Kate Stuart. Sophomores Jesse Compher and Corinne Schroeder were recipients of Hockey East Monthly Awards for December. Compher, with 11 points in five games, was named Player of the Month. 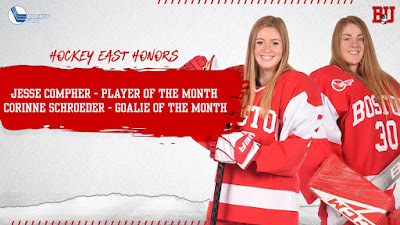 She also leads Hockey East in scoring with 32 points, which is third best in the nation. Schroeder, selected as Goaltender of the Month, produced a 1.02 GAA and a .964 save percentage in four games (3-0-1).